Hello there! 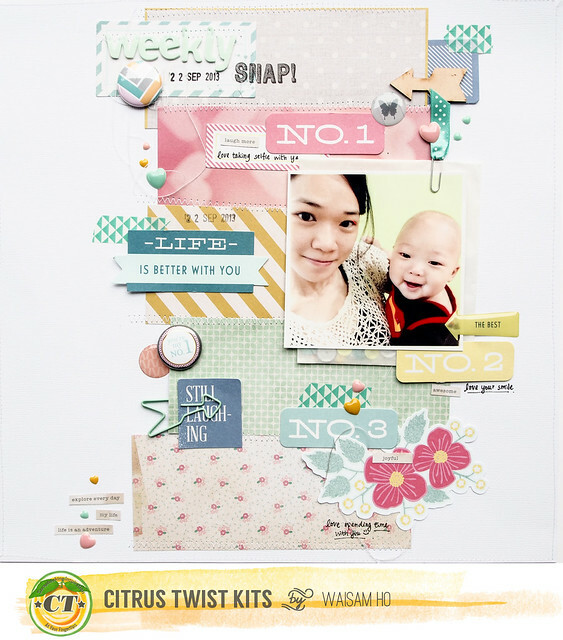 This is Sam here today to share my layout using the 6x6 paper pad included in October Pocket Life kit. Since the paper pad comes in 6x6 size, so I always end up trimming my papers to a piece of 4x6 or two pieces 3x4 cards. Then I would always end up with scraps with 2'x6'. So today I am going to show you one of my layout using the bits and pieces in 2'x6' sizes. I just lined up (vertically) 5 pieces of 2'x6' scraps that left over from Crate Paper Flea Market collection. As usual, they always coordinate really well since they came from the same collection. And then I just mat my photo with the glassine bag (that came in the kit) with a lot of sequins. I added the die cut pieces No.1, No. 2 and No.3 from top to bottom to guide the flow of the layout. Loving the stamp from main kit ' Celebrate'. I love the doodling stamp that written SNAP! which formed part of my title as the layout featured my weekly photo of me holding baby with only one arm. 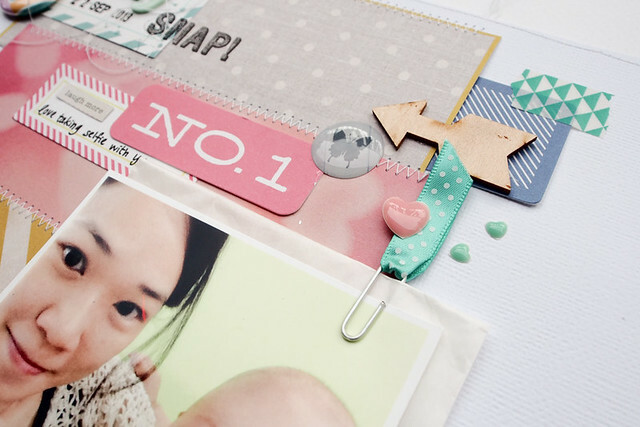 The exclusive flair in chevron pattern also acts as the arrow to guide the flow of the layout. 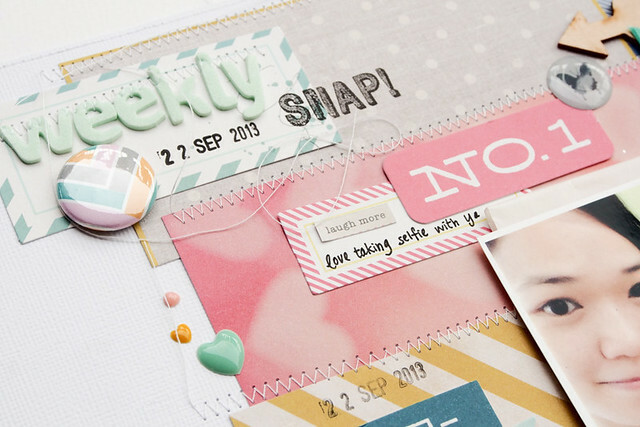 Those paper clips with ribbon tail (exclusive in the October Main Kit - Celebrate) is simply brilliant! That's for my layout using the leftover from the pocket life kits. 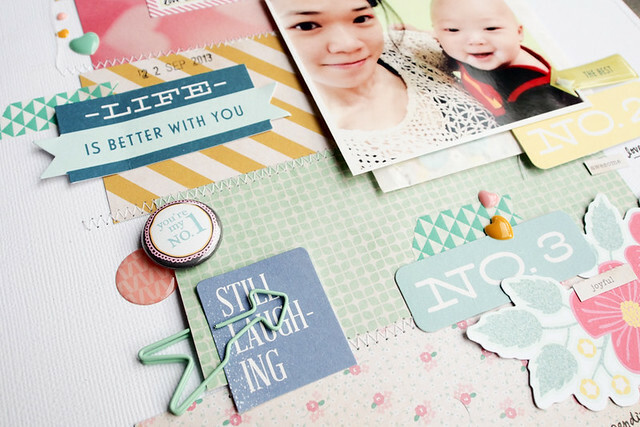 I hope it inspire you to use up some of the scraps or left-over before throwing them away. Thanks for looking and enjoy your day! 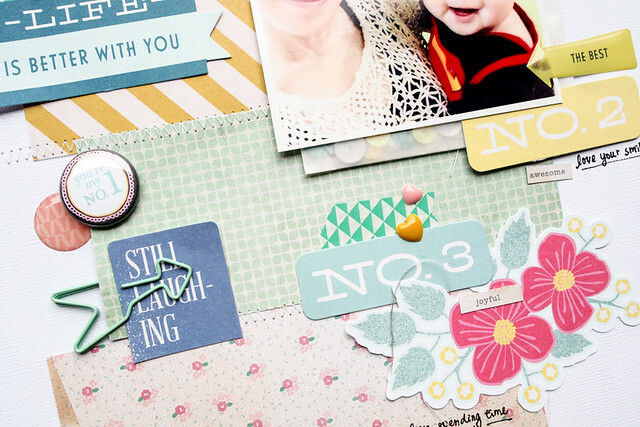 Such a fun layout Sam! Love the layers & stitching too!